IBM Enterprise Records provides content, processes and connectivity to help you maintain and provide a record of compliance for electronic and physical records. The comprehensive solution enables you to streamline records-based activities and help enforce compliance with retention policies, with or without user participation. Using IBM, you can capture, declare, classify, store and dispose of electronic and physical records according to fiscal, legal and regulatory requirements. Also, available on Cloud. Automates the records management lifecycle process, helping to ensure best practices and reducing user-related errors. 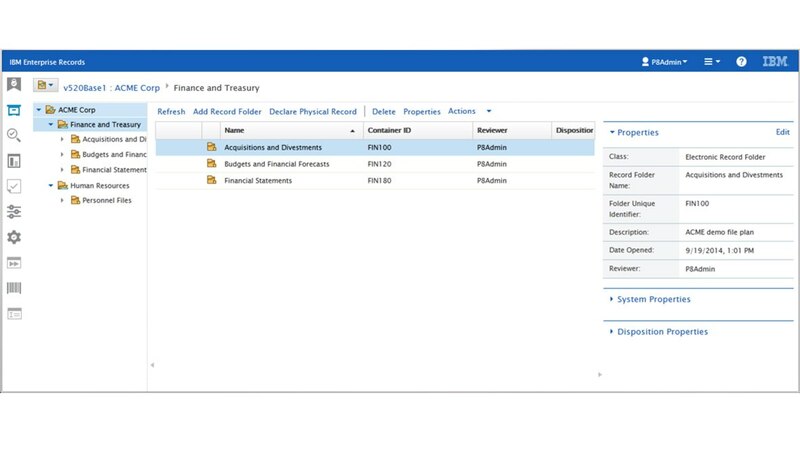 Enables prescriptive lifecycle records management while leaving content in original IBM and third-party repositories. Reduces the risk of unauthorized changes to native content. Provides all software and management services through a monthly subscription. Includes the same capabilities as IBM Enterprise Records on premises, while reducing the need for skilled staff.